A new YouGov survey released this week found that 5 percent of registered voters think President Trump is liberal, 19 percent think he’s moderate and 51 percent think he’s conservative. So, a majority of voters think the Republican president is a conservative. Typically, that wouldn’t be news. With Trump, however, it is. Trump was an unusual candidate in many ways, but one important one was that before he took office, we knew less about his political philosophy than that of perhaps any other modern president. We’re now almost a year into Trump’s tenure, though, and his policy agenda has been almost entirely orthodox Republicanism. Voters have noticed. Before Trump moved into the White House, he took a mix of liberal and conservative positions. He was, for example, vehemently against illegal immigration but in favor of infrastructure spending. He was against gun control, but he claimed to be stronger than Hillary Clinton on LGBT rights. 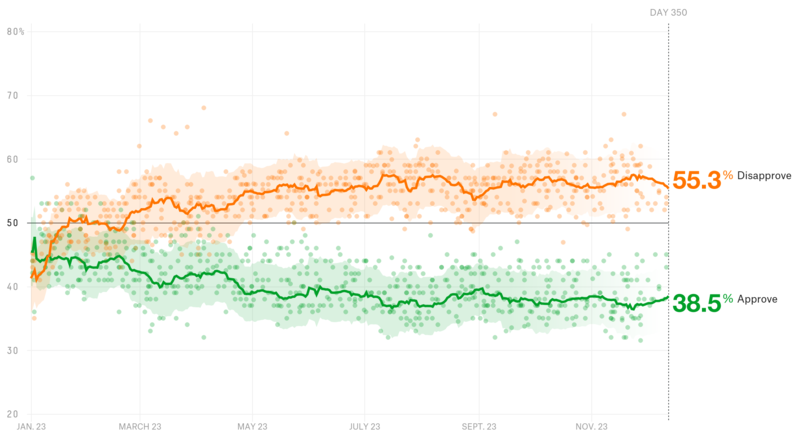 When you totaled up Trump’s ideological score on economic and social issues from the website OnTheIssues — which assigns an ideological grade to politicians’ statements and votes on a scale that we’ve converted to go from -5 (very liberal) to +5 (very conservative) — he came in at +42.5. His score was closer to 0, perfectly “moderate,” than any incoming president of the past 40 years except George H.W. Bush. The total score scale goes from -100 (liberal) to +100 (conservative). The economic and social scales go from -50 (liberal) to +50 (conservative). Trump’s stances led voters to believe he was relatively moderate for a Republican — or at least that he was ideologically idiosyncratic. More voters viewed Trump as liberal than any incoming GOP president since at least Ronald Reagan, and fewer voters viewed him as conservative than any Republican since at least Reagan. That stood in stark contrast to Clinton, whom the clear majority of voters saw as liberal. Trump’s ideological positioning relative to Clinton’s may have been one of the reasons he was able to pull off a slim Electoral College victory against her. Upon entering the White House, however, Trump has taken up a primarily conservative agenda. He’s become hawkish on foreign policy, he stocked the federal courts with conservative judges, and he urged Congressional Republicans to push through a massive tax cut that was seen as mostly helping the well-to-do. He also tried to stop transgender Americans from serving in the military. The national infrastructure project seems to be going nowhere. Therefore, it’s not surprising that Trump’s White House policies have pushed his OnTheIssues score toward the conservative end of the spectrum. Trump’s score is now a +60, compared to a +42.5 before the election. OnTheIssues now classifies him a “hard-core conservative” and places him just behind Reagan in the pursuit of the title of the most conservative president. Voters think so too. Since before Trump took office, YouGov has been asking voters to place Trump on an ideological scale from “very liberal” to “very conservative.” Compared to a four-week average in the lead-up to Trump’s inauguration, the most recent four-week average finds far fewer voters saying he is moderate or liberal and far more saying he is conservative. The 2017 and 2018 averages each include four consecutive weekly polls. The final poll for 2017 had an end date of Jan. 17, 2017. The final poll in the 2018 average had an end date of Jan. 2, 2018. It’s not entirely clear what broader electoral impact Trump’s move to the right might have, but it’s probably not helping Trump himself. As I said, there’s an argument that Trump’s unusual ideological profile played an underrated role in his election. But now, most voters think the president isn’t compromising enough, Trump’s job approval rating remains below 40 percent, and Democrats maintain a large lead on the generic congressional ballot. In a Gallup poll, more Republicans rated almost every federal agency either excellent or good than did so in 2014. The one exception was the FBI, whose excellent or good rating among Republicans fell from 62 percent to 49 percent. Support for the “new tax reform law” is up to 40 percent among registered voters in YouGov’s latest survey, but opposition still outruns it at 45 percent. The Pew Research Center found that Jehovah’s Witnesses and Buddhists are the most likely to say they meditate at least weekly (77 percent and 66 percent, respectively). Ron DeSantis has a small lead in the Republican primary to be Florida’s next governor, according to a Remington Research Group poll. DeSantis (who Trump has endorsed) came in with 28 percent to Adam Putnam’s 25 percent. Ahead of San Francisco’s nonpartisan mayoral election in June, Public Policy Polling gives Mark Leno 26 percent and acting Mayor London Breed 20 percent (with the rest of the potential field far behind). San Francisco uses a ranked-choice system, so whoever wins will eventually need majority support. An amazingly high 60 percent of Americans said in a Gallup poll that “honesty and ethical standards” among members of Congress were low or very low, which was higher than for any other profession the poll asked about (even lobbyists). Only 18 percent of Americans told YouGov that they want to “become ‘viral’ on social media or famous on the news for a short time.” There was a big age gap, though, with 36 percent of those 18 to 24 years old wanting that fame compared to only 8 percent of those 55 years old or older. Trump’s job approval rating has risen to 38.5 percent, while his disapproval rating has dropped to 55.3 percent. Two weeks ago, his approval rating was at 37 percent to a disapproval rating of 56.4 percent. 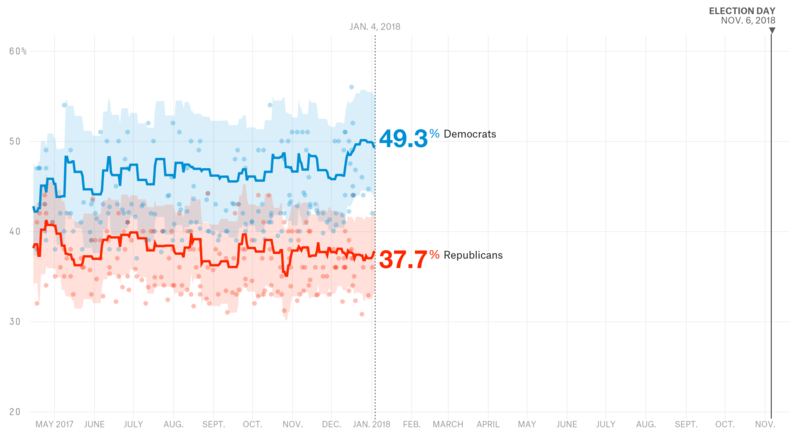 Democrats’ advantage over Republicans on the generic congressional ballot stands at 49.3 percent to 37.7 percent. Two weeks ago, Democrats were ahead 49.6 percent to 37.4 percent.